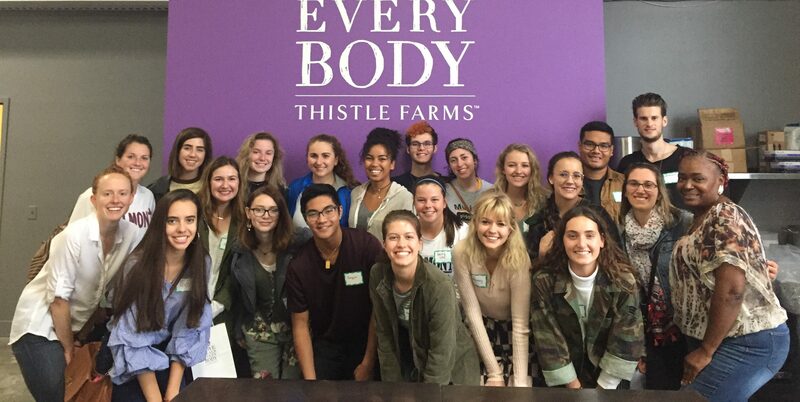 Recently, students in Dr. Mary Ellen Pethel’s Introduction to Global Leadership Studies class visited Thistle Farms, an organization designed to heal, empower and employ women survivors of trafficking, prostitution and addiction. Students listened to the stories of leaders at Thistle Farms and toured the new facilities. They learned about the complex worlds of NGOs, social enterprise, spiritual development, legal realities, financial sustainability, marketing, education and service.